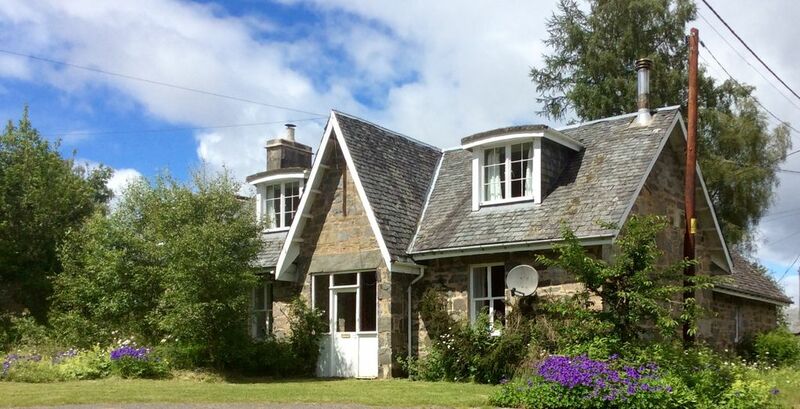 Set on a rural historic Highland Perthshire Estate close to Loch Rannoch and on the edge of the second largest remnant of ice age forest in Scotland. Lovely traditional cottage with spacious lounge with wood-burning stove. Peat can be bought from the Estate and we will light a welcoming fire for guests arriving in colder weather. Large games room or secondary lounge. Sleeps 4 in one double room and one twin. Large kitchen/breakfast room with dining room , downstairs bathroom. Plenty of room and outside garden area for sitting out and summer barbecues. There are other Estate properties around the cottage, some in need of refurbishment, but it's very quiet and private. Please read all the property notes and facilities before booking. Electric at 18p per unit. Bed linens included but bring your own towels. Bath, with shower mixer tap. Free standing electric heaters. Electric charged by meter reading. Bed linens provided, bring your own towels unless overseas visitors can hire towels for £3 per person. Do not light and have it burning high if you are leaving it unattended. No coal burning, wood or peat only. Sunny and bright, with wood burner. Mix of vintage and eclectic furnishings. Fridge with small freezing compartment. All crockery, cutlery and glasses are provided. Separate dining room table seating 4. Large games room or secondary lounge with darts and board games and open fire. Darts and board games in the games room. Basket of toys in games room. The water supply is untreated and tinted brown with peat, we recommend bottled or boiled water for drinking as no chemical treatment is added to the supply like mains water. There is a clear spring for drinking water on the Estate. Please ask where the location of the Spring is if you would like to have clear drinking water without peat content. Property on a private bio system so nothing to be flushed down the toilet that would cause blockages. Peat can be supplied for £12 a sack for the woodburner . Electric charged at 18p a unit by meter reading. Please note that cleaning at £35 per hour will be deducted from the good housekeeping deposit if the property is left in a dirty condition. An adventure that we throughly enjoyed - quirky setting, cold shower and derelict surroundings made this an interesting stay though. But we knew what we had signed up for and what you could expect for the price! Wonderful fire place, cosy lounge and the feeling of being far away from civilization made this a memorable and enjoyable weekend. Glad you enjoyed your stay and appreciated the positives of this cottage and location. Had we been informed the shower wasn't getting hot we could have remedied it, the ceiling pull switch has to be pulled to get it hot. Hope to have you back to enjoy another adventure! This house is on the site of a former private school and the surrounding buildings make it seem as if they have just upped and left one day. Inside the house there is basic but everything you may need facilities. The log fire in the living room is absolutely lovely and warms the whole house. There is no wifi or signal and just Freeview on the tv so it is perfect for the quiet getaway. You fill up your bottles from a nearby spring for your drinking water supply. This and the millennia of bright stars and the sounds of the rutting stags made it very special for us. Thanks for the honest review, we are happy to be providing a place to let guests enjoy the beautiful surroundings and peace and quiet. With no light pollution the starry skies are a wonderful sight. Great for a fishing trip. And getting away from society for a few days. No wifi (superb). Actually had a good chin wagg for a change. Take all your essentials. As no shops nearby. The décor and condition was like a film set from the seventies. Thank goodness for the log burner to provide a little home comfort. Paying extra for electricity, and a "breakages" deposit was a throw-back as well. But it was very quiet and nice to be surrounded by semi-derelict buildings. The property photos clearly show its definitely not 1970s style, we are old enough to remember that era. The cottage is peaceful, quaint and traditional, most of our guests love it as the visitor comments show, only the people that pay for budget accommodation prices that expect Gleneagles standards might be disappointed. We are very happy you loved the cottage and location. Thanks for the five star review, we look forward to seeing you again. Thank you for the lovely review, we are really pleased you enjoyed the cottage and the surroundings. For anyone wanting a peaceful holiday away from it all this cottage is a quirky retreat.We are also glad you enjoyed family time, some guests don't like the idea of not having wifi but to really unwind and relax with family and friends there is nothing better than keeping off the phone and internet for a few days to restore the mind. We look forward to having you back for another break! Please bring the £8 per person linens/ towels charge unless you pay by card online..Electricity is charged by meter reading and to be paid before departure. You can work this out by taking the reading before departure and units are charges at 16p which is what we pay. A cleaning charge will be deducted if the property is left in a dirty condition.